At Christmas time, we hear a lot about the North Pole where Santa Claus lives. We see movies and television shows about his home and workshop. Songs are sung about Santa departing the North Pole for his run around the world to deliver gifts to all children. And little ones pore over story books with pictures of Santa and his elves loading the sleigh that zooms across the sky on Christmas Eve. Two couples in our neighborhood—one across the street and the other, two blocks west from our house on the corner of Ninth and Quitman Streets—have created a magical North Pole on their lawns and around their homes. At least, that’s what it looks like to our six-year-old great grandson, Timothy. He squealed with delight when he saw each place, and exclaimed: “We’re in the North Pole! It’s like a whole town! !” Indeed with colored lights outlining shrubs and hedges and oversized snowflakes hanging from tree limbs, both places are magical. One of the yards has blow-ups of Frosty the Snowman, with snowflakes falling inside the vinyl globe. A Nativity takes center stage in the front yard—and dozens of lighted candy canes dance down the edge of the sidewalk. To a first grader, the scenes are the North Pole. 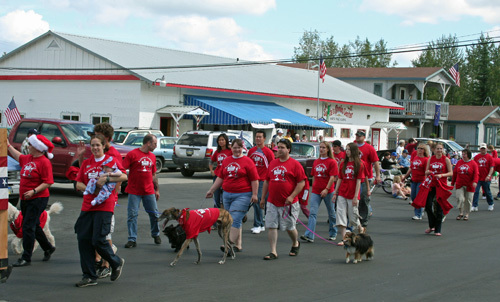 While many images and stories about the North Pole are invented, North Pole, Alaska, is as real as any other American small town, incorporated as a first-class city on January 15, 1953. Its citizens capitalize on their name year round with the Santa Claus House, the “official” home of Santa Claus. 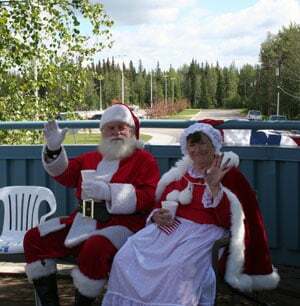 Santa greets all visitors—summers or winters–who pass through the city on the Richardson Highway. Live reindeer and an opportunity for a photograph with the jolly old elf at the Santa Claus House are available year round. Today, many streets within the City and surrounding communities bear holiday names: Santa Claus Lane, Snowman Lane, Kris Kringle, Mistletoe, Holiday Road, Saint Nicholas Drive, North Star Drive, Blitzen, and Donnor. Street lights are decorated in candy cane motifs and many buildings are painted with Christmas colors and designs. Each year the North Pole community starts the holiday season with a Winter Festival including fireworks, a candle lighting ceremony, Christmas in Ice, an ice carving festival, and a community tree lighting in December. Yet, North Pole has a summer side. Lee and I have only visited North Pole on July 4. 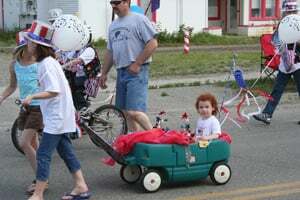 We stood along the streets with Christmas names and watched the typical small town patriotic parade—a color guard, children pulled in decorated wagons, bicycles decorated in red, white, and blue, small floats, classic cars, fire trucks, and dogs outfitted in Christmas attire. 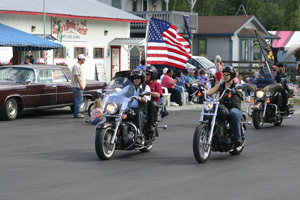 Parade watchers along the sidewalks waved small American flags while motorcycles and other vehicles carried flung large flags like banners against the blue summer sky. When the parade ended, every person—citizen or visitor—was invited to an old-fashioned July 4th picnic atop one of the city’s public buildings. Santa and Mrs. Claus took center stage, spreading Christmas greetings, as well as noting that we celebrated the birth of our country. Hamburgers and hot dogs sizzled on hot grills, filling the air with tantalizing smells typical of a July 4th celebration. 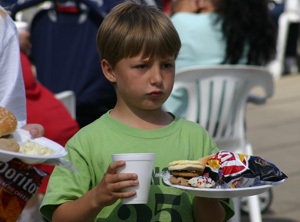 Folks lined up for plates of food, visiting easily with each other while waiting. However, North Pole is forever North Pole. And Santa’s House was open for browsing and picking out that special Christmas ornament to remember a visit to the magical, but real, North Pole. An enchanting place in one’s mind—yet a definite town on America’s maps—a place where Santa launches his astonishing run around the world to deliver toys on Christmas Eve. But also, a town where ordinary people live, work, and celebrate holidays—Christmas and July 4th.